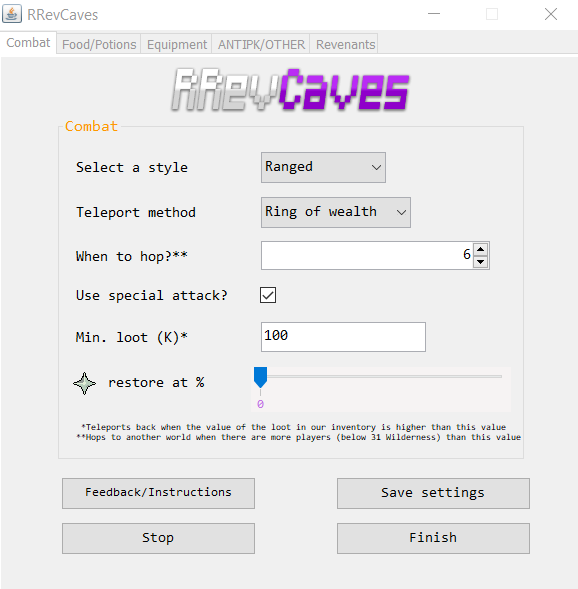 RRevCaves is a premium script/bot that kills revenants in the wilderness. Make sure u read this thread ﻿thoroughly before you decide to run﻿ the script﻿﻿﻿. GP/h with only ~85 range , no salve ! I do not recommend using the script during peak hours or in weekends. or 90+ attack and strength || a salve amulet (e) with 85+ attack and strength and a elder maul/godsword/whip. 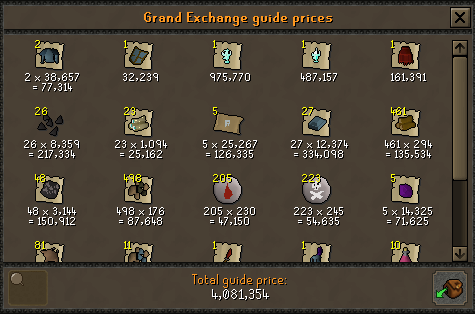 It is still possible to make decent amount of profit but you will have to compete with lots of pvmers with very high range levels. There are also more pkers active during the weekends/peak hours. This script is made fully intended to go premium at some point. Enjoy it for free while you can! 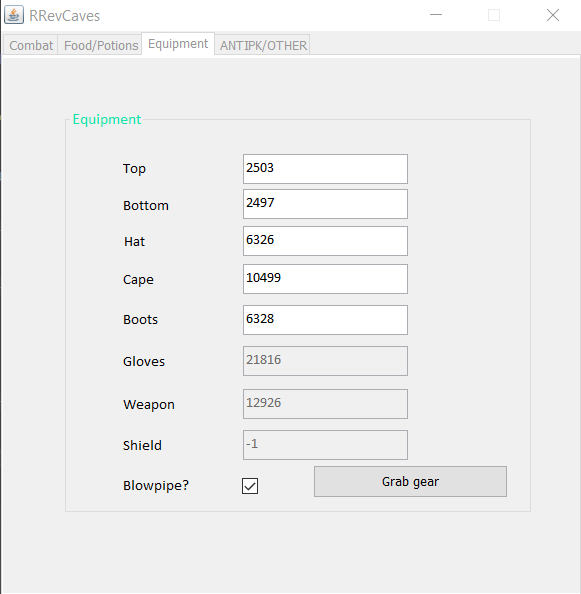 I've gathered data of pkers and made a list of items that pkers usually wear. 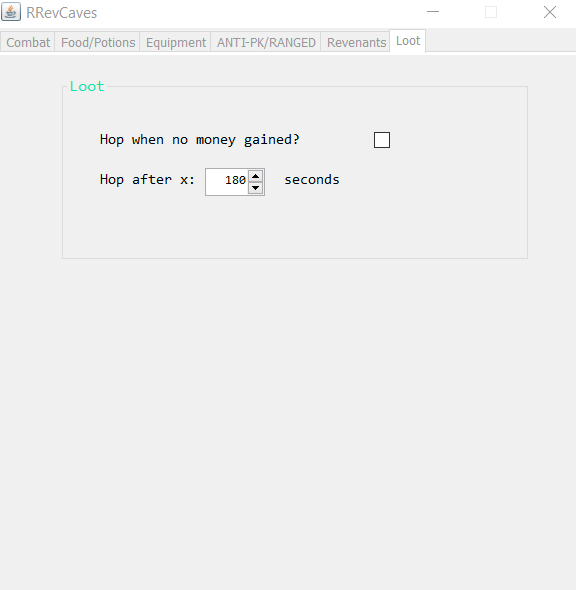 It teleports back when the loot in our inventory is worth more than the set threshold value. 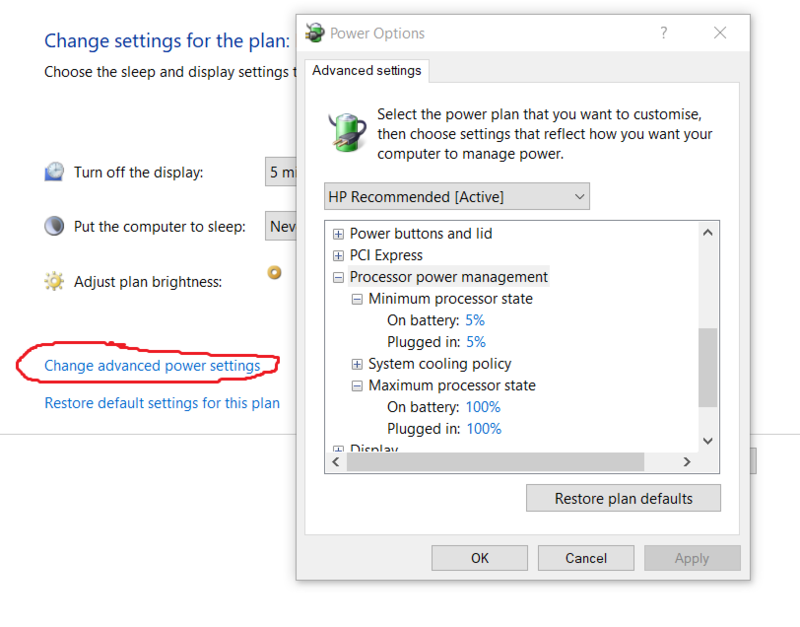 It supports uncharged bracelets. 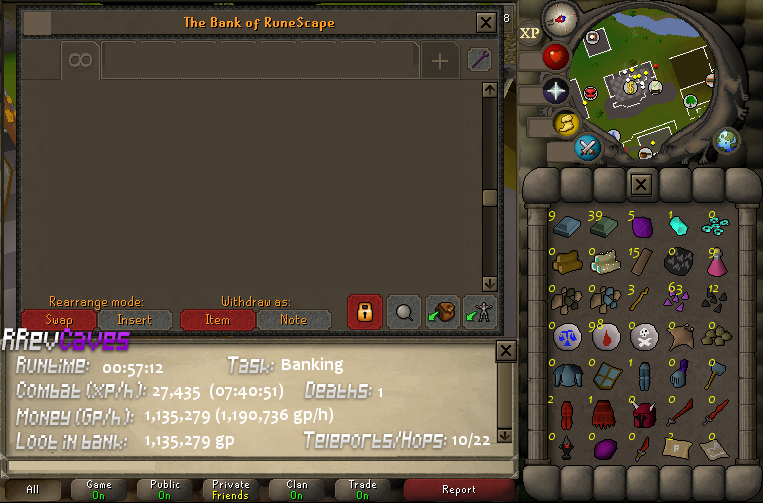 Will now grab an uncharged bracelet if you don't have one in bank and if you are not already wearing one. 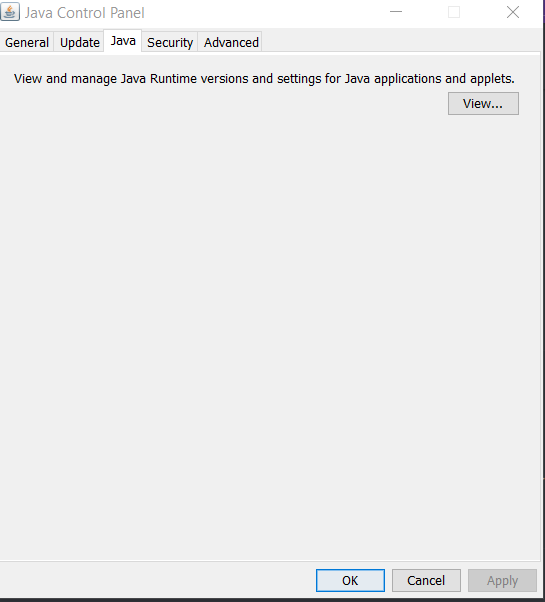 Search for java on windows and click "Configure Java"
Go to the java panel and click "View..."
Now listen closely. 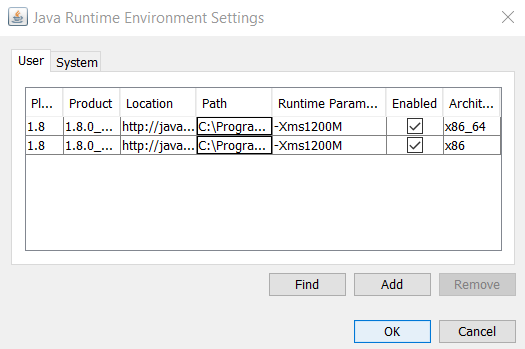 Copy this: -Xms1200M and paste it into the "Runtime Parameters" textfield. If you run it in resize-able ensure the client size is big enough. The are inner problems with the client's "inViewport" method. 04/06/18 - Added uncharged bracelet support. 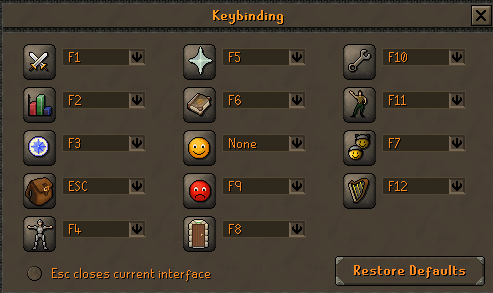 Will now grab an uncharged bracelet if you don't have one in bank and if you are not already wearing one. 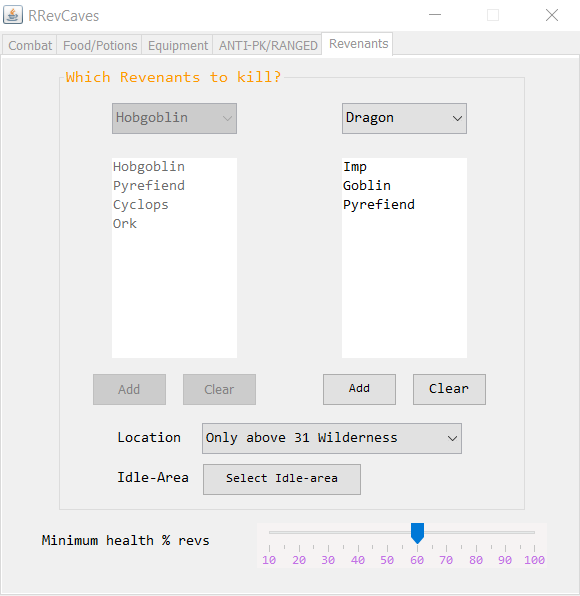 19/06/18 - Added special attacks, other revenants and option to choose to kill revenants above/below 31 wilderness or randomize this. 11/07/18 - Reworked some stuff. Will now attack the revenant we were attacking when we get interrupted by looting/eating/drinking , making it much smoother. Looking forward to trying this out. Thanks! Script removed pending discussion of your "pay to unlock.." feature, which to my knowledge is not allowed as it constitutes a private sale and takes away customer protection via powerbot, bypasses legal safeguards we have in place, and in general circumvents our premium script system. It has been confirmed that this is not a practice that is allowed. Decide which action you want to take in light of this and then inform us of your decision. - Added uncharged bracelet support. 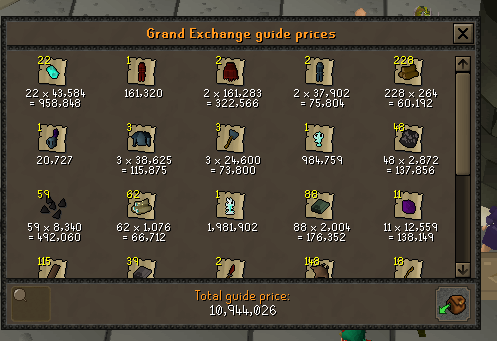 Will now grab an uncharged bracelet if you don't have one in bank and if you are not already wearing one. Does not work - starts and then stops. Please read "Starting Information" in advance next time. 1. Run energy is used very inefficiently. The script utilizes running all the time when it doesn't need to. 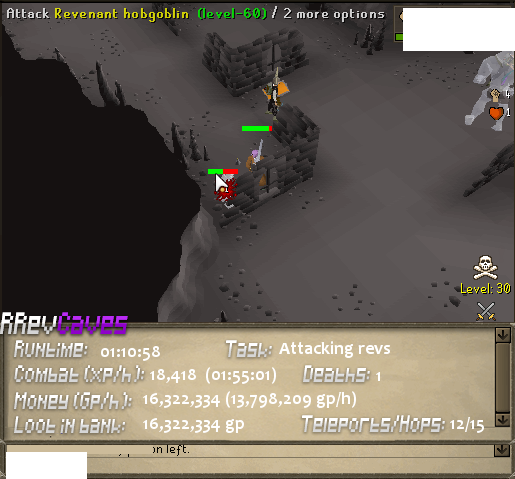 It would be nice to have 50% at least while killing revs (especially for melee users) as this would aid in getting to revs quicker for faster kills as well as avoiding pkers. Sure you could use stamina pots but the amount of pots used would be astronomical and it would be fairly tedious for banking purposes. 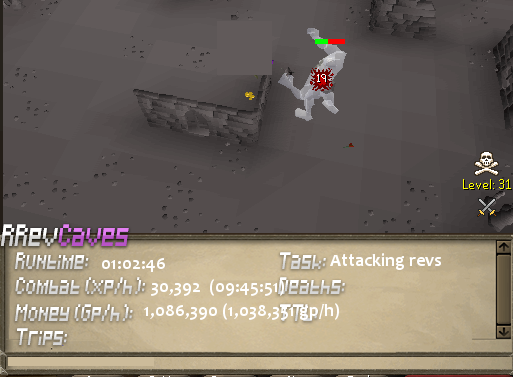 The only time run is really needed is when you are actually killing revs or getting attacked by pkers. 2. 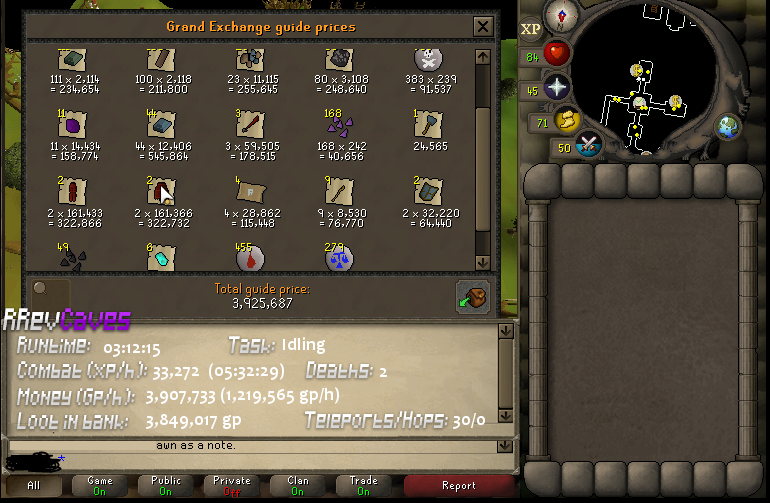 Anti-pking works far better than expected. I was skeptical at first. However there have been a few instances where I was babysitting the script and it didn't hop when there were clearly several pkers. I have noticed that the bot doesn't recognize several items very well or they aren't on the list of pk items. Things that should be added are: Ballista, Rune kite, Rune legs, D spear, and Xerican robes. 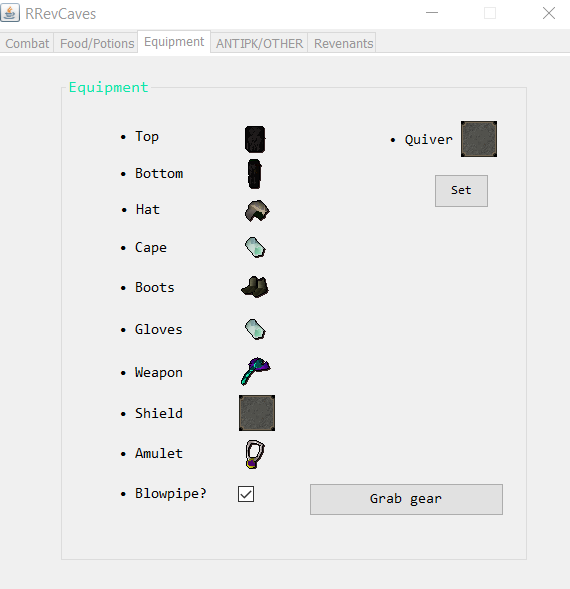 I've made several hundred mil in my free time killing revs by hand and I have yet to see a pvmer equip any of the items listed above. 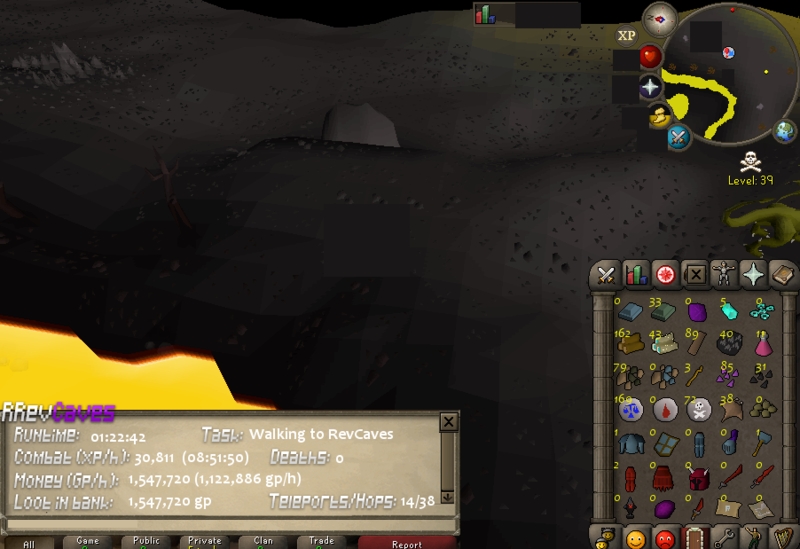 I have noticed a few times now that I am walking WITH pkers while the script is taking my toon to the rev cave and it also doesn't tend to notice nonskulled pkers hanging out at the cave entrance. 3. 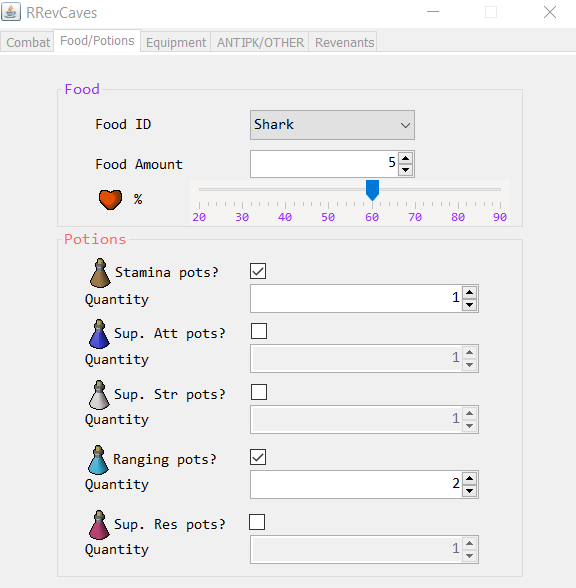 Tweak the potion support so the script recognizes to pot at the same time. For example, many times it will use a super attack and not a super strength. The stats will be very lopsided and isn't optimal what so ever. I would also have it pot more frequently as quicker kills with higher stats is more beneficial. I have noticed the script lets the stats get back to normal. 4. Special attack support would be great. Especially for those using melee gear. 5. Please adjust the looting time. 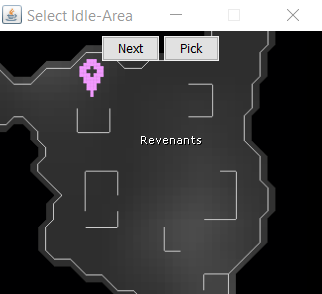 Currently it will kill a rev and run away right away and then run back to the item on the ground. Sometimes it will run from the Dark Beast all the way to the Greater Demon and back. Very ineffective and very botlike. Huge waste of run energy as well. 6. I have noticed a few times that the script hangs up between 10 and 13 minutes of run time. It just ends. 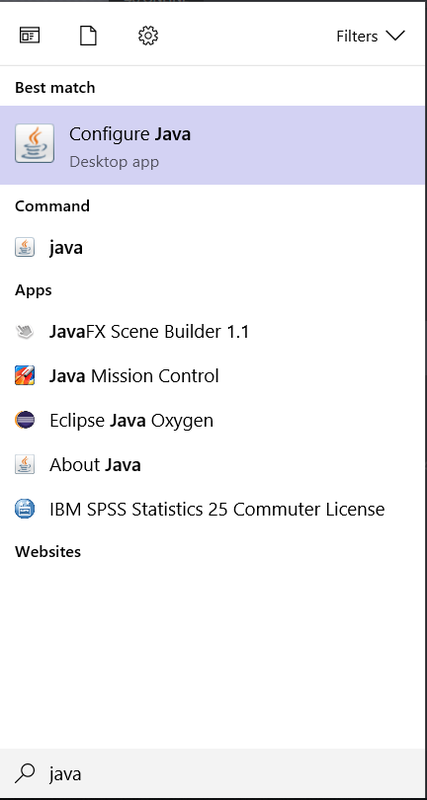 No debug data available in the logger that would help. Typically occurs after a world hop. 7. Twice now I have watched it kill a rev and then just world hop due to amount of players. Once a D skirt was left behind and another time it was onyx bolt tips. 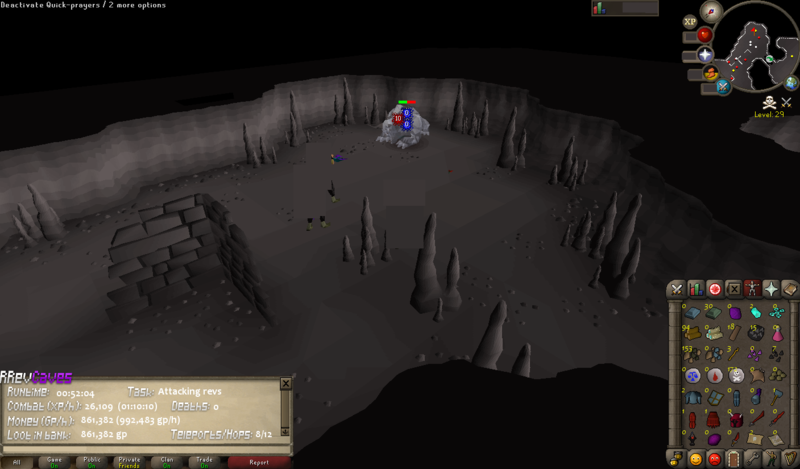 No pkers were there. 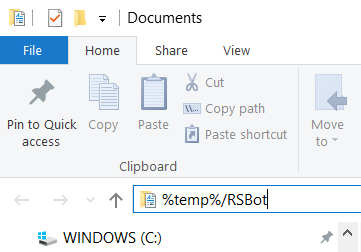 This script is really decent for the first public version. It should definitely be a premium script with a higher than average monthly fee. 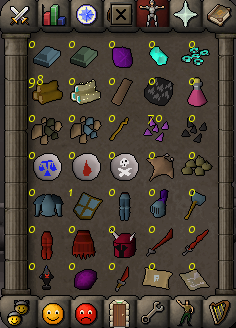 Add a selection for which revs to kill and I would happily pay $30.00USD/Mo, as long as any time or profit caps are lifted of course. If you are worried about the script being abused because of it's potential or simply worried about getting your money out of it, I would definitely make it a premium script with a fairly high price tag. You will still have plenty of customers, especially after some refinement. Can't add script from SDN? Odd. Was looking forward to trying it lol. Notice it still hopped instead of picking up loot when world was considered "busy"
Updated it. Added more sleep. 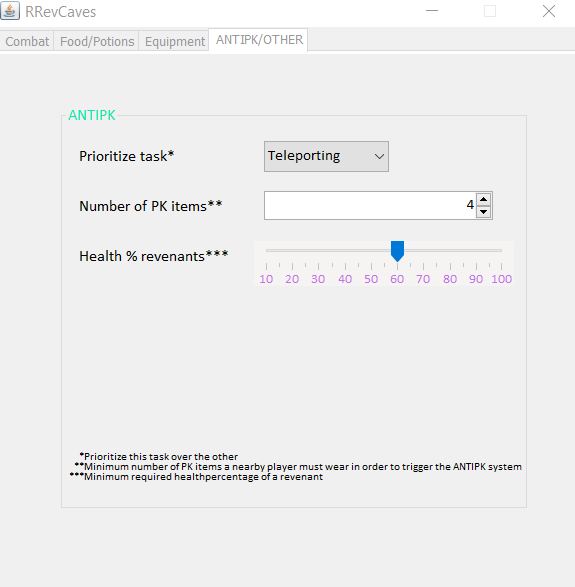 Would not be efficient.For run energy and health/pray -> if you consider the amount of teleports. It would go to cwars everytime it teleports back, and based on my current experience it teleports 15/h. I would also have to create an extra task just for checking the charges of the ring of dueling and it would not work when youd use a ring of wealth. Can add a option that it heals to full at bank, or maybe regenerate at your house. Sadly recieved ban with this script after about 1 hour of runtime.